Connecting Cities was initiated by Public Art Lab Berlin in 2012. The Connecting Cities Network reflects on the increasing worldwide presence of large-format digital media facades in the public space and examines their function as cultural and their unique communicative elements. In contrast to the commercial use of these urban media facades, we establish them as platforms on which citizens can exchange – within the city as much as between cities. The European Commission selected Connecting Cities for a multi-annual funding 2012-16 supported by Culture Programme 2007-13. In the framework of Connecting Cities 2013 : Networked City, iMAL organised an event on the metro esplanade Comte de Flandre / Graaf van Vlaanderen and its surroundings. For two days, Brussels was connected to Liverpool (UK), through a series of surprising, participatory and playful artworks accessible to all in the public space. With: Sander Veenhof, Jeremy Bailey, Varvara Guljajeva & Mar Canet Sola. Last year's theme was Participatory City. How can we open the screens as digital stages for public interventions? What is the impact of participatory projects realised in the European space on audience and community development of the European neighbourhoods? 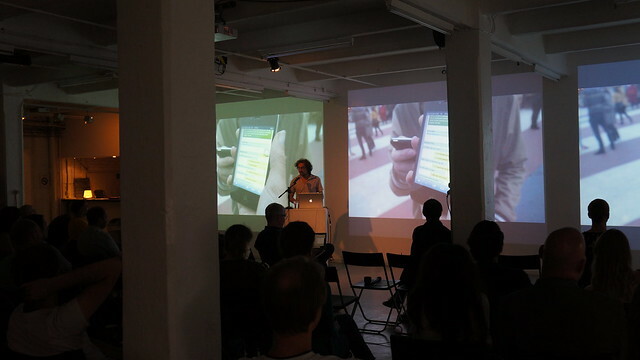 In June 2014, iMAL organised the Connecting Cities Urban Media Lab, a symposium and intense 6-days masterclass that explored new forms of urban participation. With: Katía Truijen, Niels Wouters, Tobias Revell, Nanna Verhoeff, Martijn de Waal, Mark Shepard, Michael Smyth, Ali Momeni & Sander Veenhof. In the framework of Nuit Blanche 2014, iMAL, FACT Liverpool & Medialab Prado Madrid invited Ali Momeni for Telepuppet.tv.